Current climate variability, such as the major droughts of 2005/6 and the major floods of 1997/8, already has significant economic costs in Tanzania. These periodic extreme events cause major macro-economic costs, reduce economic growth and affect livelihoods: the 2005/6 drought affected millions of people and had estimated costs of at least 1% of GDP. These events also reduce long-term growth and development and it is clear that Tanzania is not adequately adapted to deal with existing climate risks. Future climate change may lead to a change in the frequency or severity of such extreme weather events, potentially worsening impacts. Climate change will also lead to increased average temperatures (1 ºC to 3ºC by the 2050s), sea level rise, changes in annual and seasonal rainfall, and possibly changes in extreme events. These changes will affect many key sectors, possibly affecting agricultural production, health, water availability, coastal zones, energy use, infrastructure, and biodiversity and ecosystem services (including forestry and tourism). It will also lead to potentially large economic costs. Aggregate models indicate that climate change could lead to net economic costs that are equivalent to a loss of almost 2% of GDP each year by 2030 in Tanzania. Any impacts are likely to have disproportionately strong effects on the poor, as such vulnerable groups have fewer resources to adapt to climatic change. Adaptation can reduce the economic costs of climate change, but it has a cost. The costs of adaptation are still emerging but adaptation needs could be high for Tanzania. There is a strong justification for adaptation financing; however, accessing new funds will require the analysis of the options and the costs of adaptation, as well as the necessary institutional capacity. There are potential opportunities emerging for low carbon projects. At the national level, following a low carbon growth future can have significant economic benefits as well as having other social and environmental benefits. What are development partners and Tanzania doing? To better understand the economic impacts of present and future climate change in Tanzania, the development partners group, with funding from UK (DFID) Government, are funding a study to analyse economic impacts of climate change over the next year (ready for December 2010). 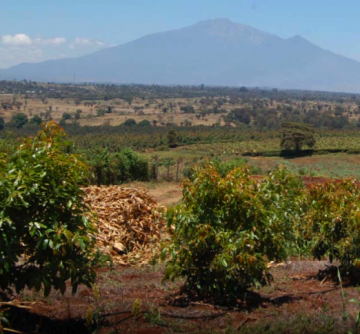 Assess climate change impacts and their economic costs for Tanzania. Analyse the costs and benefits of adapting to these effects over different timescales. Assess the potential for low carbon growth, including development benefits and finance opportunities. Build national capacity and take advantage of local knowledge. Use the results to inform decision-making at domestic, regional and international level. 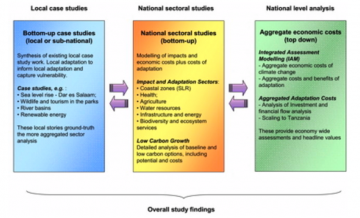 The study will use a multi-level approach that builds-up several lines of evidence on impacts and adaptation. It combines top-down sectoral economic assessment with bottom-up case studies on vulnerability and adaptation. These local studies allow consideration of livelihoods, development and poverty alleviation, which would otherwise be missed by a high level economic assessment. By doing so, local ‘stories’ are combined with more aggregated economic estimates, building a coherent message for policy makers. The combined evidence across all areas provides information for different objectives, from project level through to national priorities and the international negotiations. The methodology emphasises national ownership and long-term sustainability through the inclusion of national bodies, and a collaborative partnership approach with local teams. A series of events will ensure that stakeholders are identified, consulted and informed, with the objectives of building national capacity and taking advantage of local knowledge. Communications products and events will be used to disseminate findings.